Actress Tamannaah was initially approached by Sivakarthikeyan for his untitled next with debutant Bhagyaraj produced at a whopping budget. Due to some reasons, the actress didn't sign the project and later was replaced by Keerthi Suresh in this project. With the shoot happening at full swing, Tamannaah has made a surprise move by signing up Vijay Sethupathi's 'Dharma Durai', directed by National award winner Seenu Ramasamy and produced by Studio 9 Suresh. Vijay Sethupathi has been scaling great heights in the showbiz and with Nayantara playing the female lead opposite him, many heroines have started following her footprints by teaming up with new league of actors. 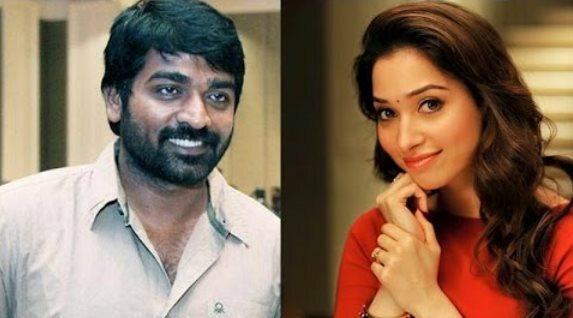 Now Tamannaah has officially confirmed her presence in Vijay Sethupathi's film. This will be out and out family entertainer set in the rural backdrops and more importance would be on family relationships.